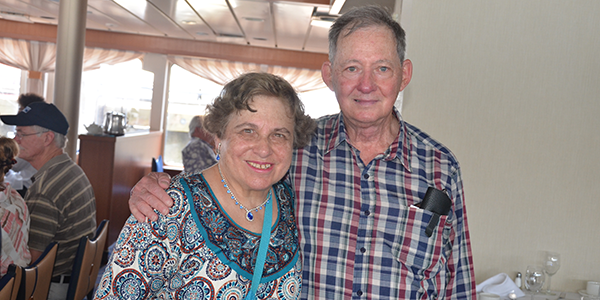 For Susan and Stanley Friedman of New York, JNF's Sunshine Mission wasn't their first time in Israel, but it was their first time on a JNF mission. "It was our 60th anniversary," said Susan. "We celebrated our 25th by taking our first trip to Israel and we thought it would be a nice way of celebrating this milestone. On our first night, they surprised us with a cake!" JNF's Sunshine Mission for active adults 55 and over is a unique journey through Israel led by JNF national spokesperson Hal Linden. The Friedman's were delighted to discover that they had mutual acquaintances with Hal Linden from the High School of Music and Art, their alma mater and where Susan and Stanley met. For a couple whose relationship with JNF has mostly been buying trees, the mission opened the Friedmans' eyes to the scope of the work that JNF does in Israel. "We didn't know JNF was involved in preserving history projects in Israel," said Susan. "We also found it very interesting to learn that JNF was working to solve Israel's water problems. We were not at all aware of JNF's work in water projects." Upon their return from the trip, they established a charitable gift annuity for water projects. "We thought a Charitable Gift Annuity would give us a good return on our money, as well as putting the money to good use," said Susan. "And it was a nice way to celebrate our anniversary." Many attendees on both the inaugural 2012 Sunshine Mission and the 2013 mission had been to Israel before, but were experiencing their first JNF mission. Cleveland's Gilda Cohen and her friend, for instance, were looking to fly to Israel after taking a cruise but preferred to travel to Israel with a group rather than on their own; the Sunshine Mission fit perfectly with their schedule. "It was such a lovely trip," said Gilda. "We appreciated that we went to places that we had never been to before even though we'd been to Israel a number of times." Through an IRA rollover, Gilda made a commitment to JNF Parsons Water Fund. "That's an area I'm particularly interested in right now because of the shortage of water in Israel and how important is it to find workable solutions. " She plans to make another IRA rollover at the end of this year, though she hasn't decided exactly where it will be going. "I plan on making another donation to JNF because I believe in JNF." The Sunshine Mission visits many of the usual tourist sites but also opens its participants' eyes to the world of JNF. From JNF's bird sanctuary in the Hula Valley, to the vibrant play of children in the JNF Sderot Indoor Recreation Center, to the state-of-the-art care taking place at Aleh Negev rehabilitative village, participants gained a deeper understanding of the vision that JNF has for Israel. Another participant, Dr. Anna Taylor, a UCLA professor, has become a more substantial donor in the past few years, donating and attending more events. She has since established a Donor Advised Fund and will be traveling on the upcoming President's Society mission. "I'm interested in the Arava region and found the Arava Institute fascinating," she said. "I particularly enjoyed the day in the Negev and learning what JNF was doing down there. I appreciate what JNF does insofar as helping the infrastructure of Israel and that it is not a political or religious organization." "We take participants on a journey through history, integrating the past, present, and future of the State of Israel," said President's Society mission co-chair Dr. Melinda Wolf. "We want to show people all the ways in which JNF has made a huge difference in the development of the country. Our goal is to have everyone come back loving Israel and feeling very connected to JNF."